I wanted to do a relatively quick post on something I have been looking at in some tweets. It is related to part of Hirsch’s book on which I had already written. I think it’s quite clear that I like Hirsch’s emphasis on the ‘low achieving’, although we probably disagree on the role ‘systemic unfairness’ plays in schooling. 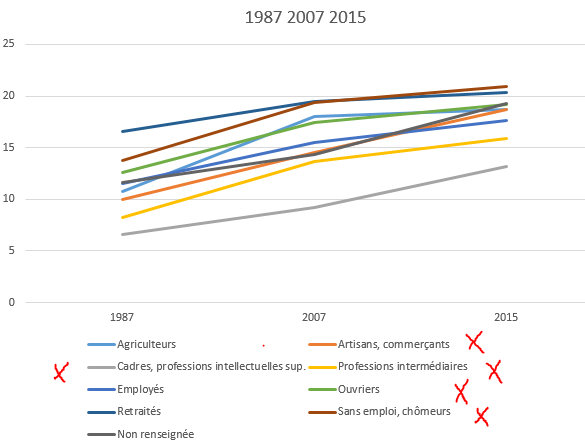 This post, though, wants to focus on one of the pivotal examples Hirsch presents to argue that a skills-oriented curriculum, contrary to a knowledge-based curriculum, increases unfairness: the case of France from 1987 to 2007 (Loi Jospin). I can probably write pages full on the ‘knowledge’ versus ‘skills’ (aren’t skills just practical knowledge?) but let’s just assume that these labels are wholly justified. I will also assume, but find the justification lacking, that what Hirsch says on the page regarding amount of funding, buildings etc. to *not* have had an influence on this, is true. I think it’s quite difficult to simply ascribe changes to just a change of curriculum, even though I grant him the curriculum change in France has been vast. 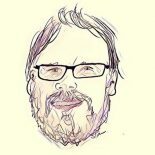 I tried to track down the data Hirsch used. In Appendix II Hirsch refers to documents from the DEPP. The data seems to come from a French department, and coincidentally 2015 data has recently (November 2016) been added to the database. The data is tabulated in this document on page 3. One of the headers states that ‘social inequality is still apparent but remains stable’. The raw data indicates ‘errors’ made (the column Moyenne denotes the mean number of errors per sub-group, Ecart-type denotes standard-deviation). I did not look at the detail of the standardised tests themselves. The document mentions some limitations, for example that labels have changed a bit over time but also the massive increase in people not wanting to give there social class of the parents (PCS de la personne responsable d’eleve). There seem to be more SES (Socio-Economic Status) categories in the data than in the book. My French is a bit rusty but I think at least one large category, probably Employes, is missing. I think that is strange. The gaps between the different groups seem to have diminished between 2007 and 2015, or -looking from 1987 to 2015- there does not seem to be a SES gap increase ie no increase in unfairness. 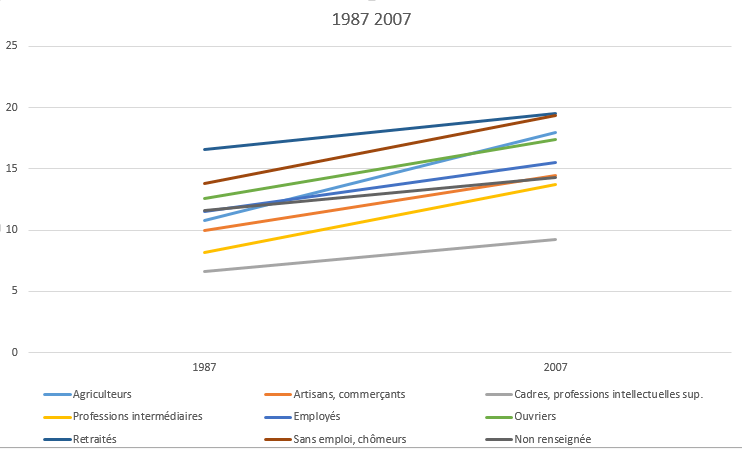 Based on this graph (sorry, I know, labels are missing etc., and I’m embarrassed to say I used Excel) one could indeed conclude that from 1987 to 2007 gaps have increased, although the gap between ‘White collar and shopkeepers (‘Artisans, commercants’) and ‘Profession intermediaires’ has decreased. As mentioned before, maybe it’s my command of the French language that conflicts with this. I also plotted the same graph but now with all categories. It seems as if the picture conveyed on page 145 of Hirsch’s book is far less pronounced. Of course, some of these categories are quite small, but in any case, one of the five largest groups has not been included in Hirsch’s book. I wonder what causes this discrepancy; it seems implausible that the use of Z-scores could explain that difference, but I’m open to be proven wrong. The categories was the first element I wanted to look at, the second is the 2015 data. I plotted the new graphs with 2015 data included. I did this for both the graph with only 5 categories and all others. It is clear that more errors are being made over the years, but the unfairness (ie increasing gaps between the different socio-economic strata) seems hard to maintain. 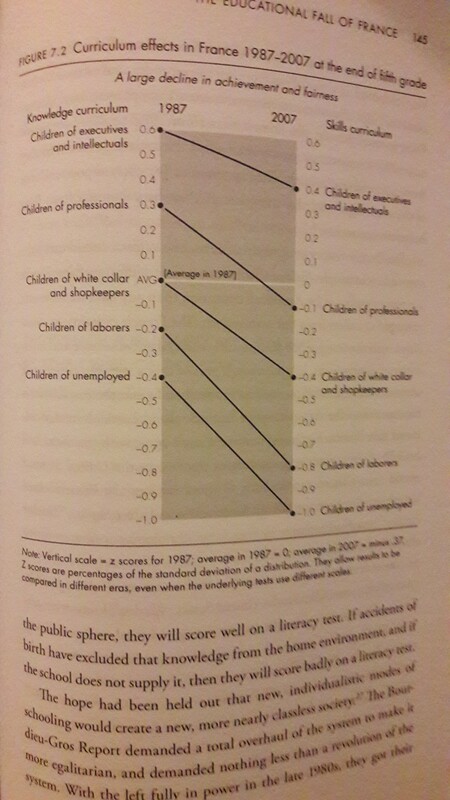 Certainly the argument that if we ‘trace the lines backward in time in time’ would mean positive equity effects (see below) of what Hirsch calls the ‘knowledge curriculum’ seems unlikely. 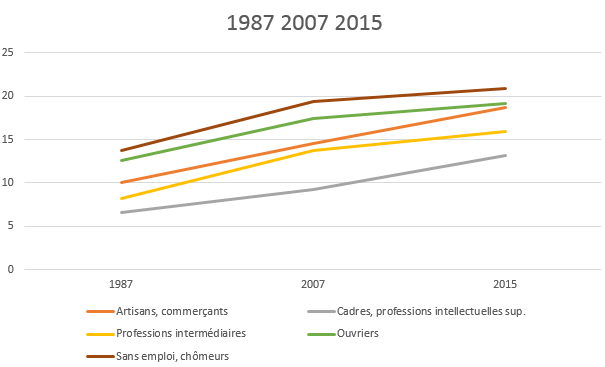 Like the DEPP themselves state, I think it is hard to maintain that the unfairness has increased; at least based on this French data. Reblogged this on Ed Blog Reader – A digest of interesting writing on educational issues. This entry was posted on April 26, 2017 by cbokhove in Education, Education Research.